Our editors are published authors of fiction and non-fiction. An acquisitions editor will often take a well-written story over a compelling storyline, because it takes less work during the editing process and saves them money. We know what it takes to get your manuscript to shine for an acquisitions editor. 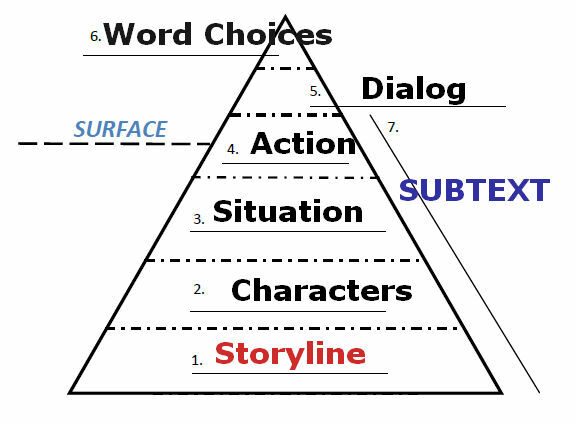 Particular experience with content edits for storyline, pacing and characterization can make the crucial difference. We can also take your finished draft and suggest ways for you to tighten your writing and use more powerful words. A content edit at Smooth Draft covers all levels of a story, from the base to the top. Most publishers only focus on levels 5-6 on our pyramid. We understand that improving your story needs a ground-up analysis. We’ll make comments and suggestions on storyline, characterization, structure, as well as the surface elements of word choice and punctuation. You choose what levels you want us to focus on. We don’t rewrite the story for you, but let you know where and how to focus your rewrite. (See our article Rewriting vs. Editing for more details). If you’re planning to send your manuscript for a specific submission call or publisher, we can make sure to follow their house style when we edit your manuscript. Every publisher has slightly different requirements, and the closer your submission is the better chance you have of getting selected. Make the investment in yourself and your book before hitting the “Submit” button to self-publish your manuscript. Beta-readers are not the same as editors, neither as thorough or as knowledgeable of grammar, syntax, pacing, and what your story really needs to grab readers’ attention and keep it. Plus, we’re not going to just pat you on the back. We’ll give you the feedback and suggestions necessary to get your story–no matter the length–into shape for any audience. Years of experience writing, editing, acquiring manuscripts, and publishing gives us the knowledge of what sells, what doesn’t, and how you can improve your manuscript so it’s ready for prime time with an agent, publisher, or reader.